An Edit Screen in Wolf Platform-as-a-Service allows the visual representation of your Entity. 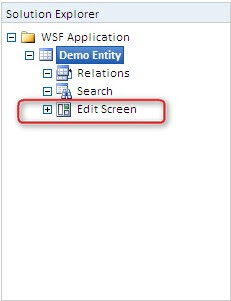 When you create an Entity, the Default Edit Screen is automatically created for you - instantly. 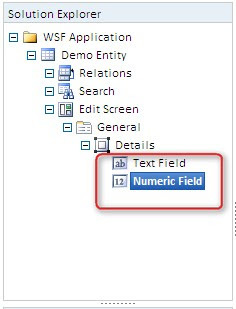 However, you may create any number of Custom Edit Screens in an Entity to allow flexible representation of your data. Lets take a look at the basics of an Edit Screen and how it will assist you to visually represent your Entity. Consider the Default Edit Screen which gets created automatically every time you create an Entity in the Wolf Designer Console. Expand the Default Edit Screen node. A Tab exists under the Default Edit Screen (this is only in the case of the Default Edit Screen). Tabs are often used for logical grouping of data/fields. For example, in an Entity used for storing contact information, different tabs may be used for storing business data and personal data of the contact. You may define any number of Tabs in your Edit Screens to fully represent your data. A Section exists under this Tab (this is only in the case of the Default Edit Screen). 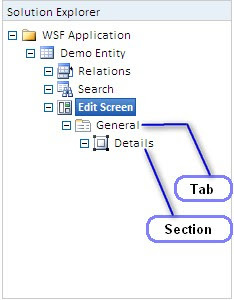 Sections are often used for logical grouping of data/fields in a Tab. For example, in a Tab containing personal information of a contact, we may have one section for the addresses and another section for the phone numbers. A section is also the place where you can start adding fields to your Entity. Note - It is a good practice to provide meaningful names to the Tabs, Sections and Fields of your Edit Screen. I have skipped this part since this is a demonstration. After providing the suitable linkages to Menu items, the Edit Screen can be accessed on running the application. So there you have it. The basics and the structure of an Edit screen in Wolf PaaS. Don't forget to check out the real time help in the Wolf Designer Console while building your applications.